It’s been a busy week and fall is definitely coming in our neck of the woods. I hope you are all well and that you enjoy this week’s web wanderings. It makes sense to me that felines would take over the crypto currency craze. There is a new “Game” on the Ethereum blockchain that lets you purchase and collect virtual cats, and then breed them with each other to try to create valuable new creatures with rare attributes, or “catributes,”. It’s called CryptoKitties and recently the most expensive in-app purchase to date happened with the sale of a CryptoKitty named Dragon for approximately $170,000, or the equivalent of 600 ETH in cryptocurrency. Now I don’t understand crypto currency but I do understand $170,000.00! Meowza, that’s a lot of catnip! You all know how much I love innovative ideas to help shelter or feral cats and this one helps the cats and the people too. The Animal Advocates, a non-profit organization that helps homeless animals in Barnwell, started the MeowMates program at the Allendale Correctional Institute in 2013. Hundreds of cats have been fostered by inmates – also known as “pet dads” – where they are socialized and cared for before being adopted. This program is working so well and is so innovative that MeowMates will be featured on an episode of the popular television show “My Cat from Hell” this Saturday, Sept. 15 at 9 p.m. on Animal Planet. “I feel the special partnership is making a huge impact on both our animals and our pet dads and it is my hope that maybe other rescues across the U.S. will see the segment and begin their own collaboration with a prison in their area,” said Vikki Scott, president of the Animal Advocates. The Tribe of Five gives this this program our “Paws Up” Award because it’s good for the felines and the humans! 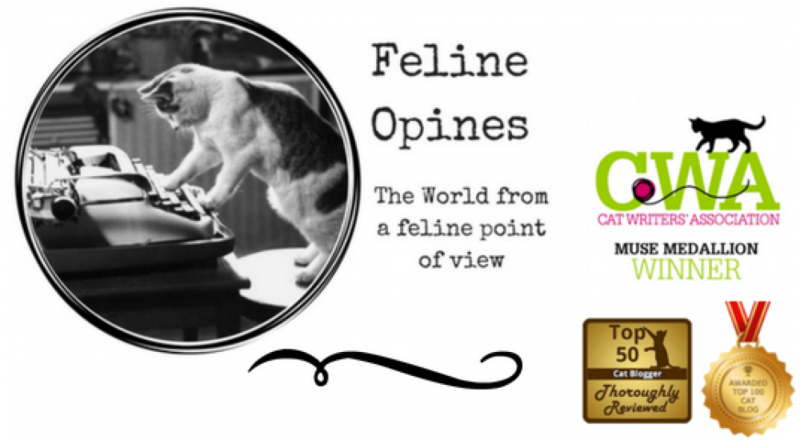 Now before I tell you about other cats on Instagram, please allow me to remind you that The Tribe of Five at Feline Opines is also on Instagram and we hope you’re following us! Any time humans go above and beyond for felines I want to tell the world about it. This is what the Cat’s Cradle Sanctuary is doing. They only take senior cats that have no chance of being adopted. “What we’re trying to do here is to give these senior cats a wonderful environment for their final years,” Bruce Jenkins explained. Everything is designed and set up[ for the comfort and enjoyment of these senior felines and that comes at quite a cost. Expenses can run over $1,000 a month. God bless this couple who are making the senior years of these cats their best years! Alley Cat Allies is a wonderful organization whose sole purpose is to help felines. And as we pray for our furiends in the path of hurricane Florence, we wanted to share some of their emergency preparedness tips. Please stay safe and be prepared! Make sure to have descriptions of the community cats (sometimes called feral cats) you care for and your pets, along with photos. If you need to look for displaced cats in shelters or other rescue areas after the storm, this will help accurately identify them. Make sure all pet tags and animal microchips have up-to-date information. Enlist a back-up caregiver who is responsible for the community cats in your absence, and network with other community cat caregivers in your area to set up a “buddy system.” This will create a safety net of care for the cats. You may be able to find other cat caregivers in your area through our Feral Friends Network™. Create an emergency contact card for your community cat colonies and pets in case you are not immediately available. Include all contact information for your substitute caregiver. Carry this card in your wallet and your car, give copies to your backup caregiver, and post it somewhere visible in your home like on the refrigerator. Make a list of local shelters and their contact information. You will need this information in case you need their help or resources. Keep an emergency supply kit on hand and know where to find it quickly. Disaster kit basics for pets include a pet first-aid kit, a supply of prescription medications for pets, veterinary and microchip ID records, three to seven days of pet food and dishes, a seven-day supply of bottled water per person and per pet, a litter box and litter, a leash and collar, crate or carrier, blankets, and photos of pets and cats in colonies. Protect outdoor cat shelters by turning the openings away from the storm surge, or, if possible, by moving them to slightly higher ground nearby. Fill multiple food and water bowls in case you may be away for an extended time. Do not try to bring unsocialized community cats with you if you evacuate. Remember, community cats are resourceful. The outdoors is their home, so they know how to deal with weather. Since it’s not possible to bring community cats with you when evacuating from disasters, they need their own special disaster plan. Read our Disaster Proofing a Community Cat Colony resource for guidance. Finally, you can always reach out to Feral Friends Network™ members in your area for help in preparing community cats for a disaster or finding them after the danger has passed. This entry was posted in adopting kittens, animal shelters, Cat adoptions, cat behavior, Cat blogs, Cat Health, Cat writers, Cat Writers Muse Award winning blog, cats, kittens, Pet blogging, shelter cats, Siamese cats, Top 50 Cat Bloggers, Walk Through the Web Wednesdays and tagged Alley Cat Allies, Animal Advocates Meowmates program, Cat's Cradle Sanctuary, Cats of Instagram, crypto currency and cats, CryptoKitties, Feline Opines, hurricane prep for cat owners, prisoners foster cats, senior kitties, senior kitty sanctuary, The Tribe of Five by Feline Opines. Bookmark the permalink. Our shelter has found homes for many senior cats over the years, but there have been a few kept as “office kitties,” loved and cared for by all of us. That is certainly a great idea to have a place where older cats with little chance for adoption can live out their lives in peace. Inmates as pet parents sounds brilliant, a win for both sides of the equation. While we do not need to evacuate now, we live where hurricanes can strike and have our water, food, papers, and carriers ready if it ever comes down to it. How could I have overlooked your IG account until now!?! Following! So scary, this hurricane thing, but having time to prepare is good! More great stories. Thank you.